This was only the second time I've gotten to experience this Dutch neo-psychedelic ensemble. There was no support act, so the band took the stage right on time. Noticed that anymore, the Dots no longer feature a drummer while out on tour. They're strictly a four-piece. Heard they have a drum machine. Crowd of about 80 patrons showed up, fully aware of what they were in store for. The Dots played a well performed fourteen song / 75 minute set. Show was cut by four songs due to the fact that vocalist Edward Ka-Spel wasn't feeling well. That still didn't deter much from the gig's overall experience. Off their current 'Your Children Placate You From Premature Graves', they did three songs - "Peace Of Mind", "Bad Hair" and "Island Of Dreams" which were good to hear. I checked their setlist and it appears they did some 'deep album cuts' from their back catalog CD titles such as ' 81's 'Only Dreaming', ' 85's 'Asylum', ' 90's 'Crushed Velvet' and ' 91's 'Maria Dimension'. Most of these tunes I didn't recognize right away, but the ones I do remember were "Poppy Day", the wailing "Gang Green" "Jesus Saves" and "Bella Donna". One of the evening's highlights was when Niels Van Hoornblower stepped off the stage and walked around the bar playing his neon - lit saxophone during "Hellsville", I believe it was. Noticed that Ka-Spel didn't exactly cut loose like he did when I saw him eight years ago. If anything he seemed to be more sedate. As for myself, I had a decent time. Wanted to mention that most of you probably know about Pink Floyd founder Syd Barrett's recent passing. As I've heard others mention it, as I tend to fully agree that Edward Ka-Spel does very much remind me of Barrett. 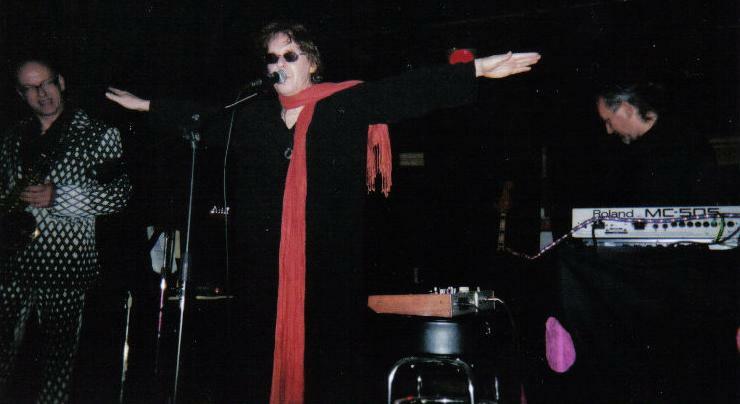 So if you ever felt short changed that you never got to see Syd Barrett perform live, as so few have (I'm sure), go catch the Legendary Pink Dots and that's about as close as you'll ever get to witnessing a live performance by Syd (R.I.P.). Line-up: Edward Ka-Spel - vocals & keyboards, The Silverman - keyboards, Niels Van Hoornblower - sax, flute & steiner electronic valve and the reunited Martijn de Kleer - guitar & bass. Check out the pink dots they had on some of their equipment in the photos I took. A nice little club show to see in early summer. Some may consider the Dots to be progressive space rock, others would say they're like I mentioned before, neo-psychedelic.